The Manuscript Institute has a special section in its archives dedicated to the work of Mirza Fatali Akhundov (1812-1878), including both published and unpublished manuscripts. Though Akhundov is mostly remembered for his founding work in theater and drama, his contribution to alphabet reform was enormous. Akhundov worked as an interpreter in Tiflis (Tbilisi, Georgia) and began his work regarding alphabet reform in 1850. His first efforts focused on modifying the Arabic script so that it would more adequately satisfy the phonetic requirements of the Azeri language. First, he insisted that each sound be represented by a separate symbol - no duplications or omissions. The Arabic script expresses only three vowel sounds, whereas Azeri needs to identify nine vowels. 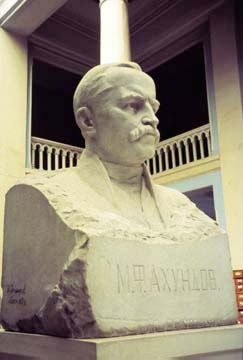 Photo: Bust of Mirza Fatali Akhundov, inside the library that bears his name in Baku. Second, he hoped to rid the script of diacritical marks such as "dots and loops," which he felt slowed down the handwriting process. Third, he felt that literacy would be facilitated if the script were written in a continuous fashion with no breaks in words. This would enable people to more readily discern where words began and ended. In 1863, Akhundov went to Istanbul and personally presented his ideas to the Scientific Society of Osmanlis. His proposals triggered serious debates in the Turkish newspapers. A number of publishers and intellectuals were against this reform. However, poet Namik Kamal strongly defended his efforts. Hot debates ensued and were amplified by those who sought to purify Turkic languages and purge all Arabic and Persian words from the Turkic vocabulary. In the end, conservative forces won out, not only in Azerbaijan, but in Turkey as well. The greatest resistance came from those who believed that since the Koran was written in the Arabic script, it is holy and should not be tampered with. Akhundov finally realized that it would be impossible to carry out even negligible reforms in regard to the Arabic alphabet. Archival materials at the Institute show that Iran strongly opposed this project, according to views set forth by the Iranian Ambassador to Turkey. 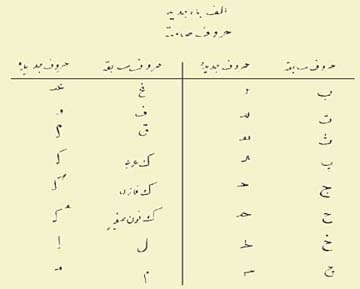 Photo: Columns in order: the second version of Azerbaijan's Latin alphabet (after 1928), the pre-reform Azeri Arabic script and Akhundov's proposed Latin script. By 1878, Akhundov had given up on trying to reform the Arabic script and was refocusing his attention on introducing a Latin-modified alphabet with a few Cyrillic characters. "Whoever wants to use the traditional Arabic script may use it, others can opt for the new alphabet," Akhundov would say. Nevertheless, despite the fact that he included a few Cyrillic characters in the proposed script, the Russian government did not lend any support to his efforts. And again, this project failed. Nevertheless, he managed to bring these issues into the public arena, and some intellectuals began discussing it in the media. In 1886, seven years after Akhundov's death, the newspaper "Caucasus" published an article by Mirza Alimammad calling for a change of the Arabic script. In 1898, several issues of the same paper published a lengthy article by Firudin bey Kocharli entitled, "The Arabic Alphabet and its Shortcomings." Jalil Mammadguluzade, editor of the famous publication "Molla Nasraddin" (1906-1931), commented on the Arabic script and the need for reform: "It is necessary to substitute these hieroglyphs with the Latin script." Nariman Narimanov, an active member of the government in the early part of the century, also criticized the Arabic script. Narimanov's solution was to accept Cyrillic, as he had written some of his novels in a modified script he had created to express the peculiarities of Azeri phonology. Akhundov was clearly a visionary whose ideas would follow only half a century later. Azerbaijan officially adopted a Latin-modified alphabet on October 20, 1923. At the beginning, both Arabic and Latin were allowed to jockey for popular use. But by January 1st, 1929, the atheist government of the Soviet Union banned the use of the Arabic alphabet in Azerbaijan. Enormous book-burning campaigns were carried out to obliterate the memory of this script. Photo: The 1857 version of Akhundov's proposed reformed Arabic-based script. Charts courtesy of "Schriftreform und Schriftwechsel bei den Muslimischen Russland- und Sowjetturken" by Ingeborg Baldauf (Akademiai Kiado, 1993). Five years after Azerbaijan introduced the Latin script, Turkey reached the same decision in November 1928. The law went into effect on January 1, 1929. But Turkey's decision to opt for an alphabet that was readable by Soviet Turkic nations was troublesome for Stalin, who feared that they would unite together against his authority. He hadn't expected Turkey to adopt Latin as well. Therefore, ten years later in 1939, Stalin moved swiftly to undermine such efforts and quickly imposed widespread use of Cyrillic in all Islamic regions of the Soviet Union. Akhundov would no doubt have smiled had he known that one of the first significant legislative acts of the Parliament of the newly independent Azerbaijan Republic was the re-adoption of the Latin alphabet. The decision came only a few short weeks after independence, on December 25, 1991. Akhundov's legacy lives on.